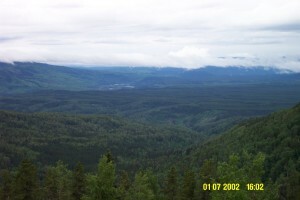 This collection of web pages is an account of my trip to the Yukon in July of 2002. 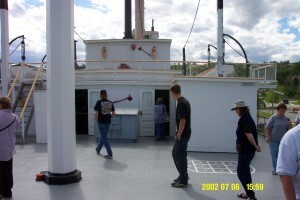 The captions on the photographs are as accurate as I can make them based on my memory of events and what I wrote in my journal during the trip. There may be errors. 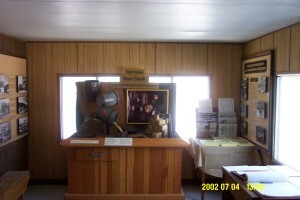 All the photos are small versions of the original. 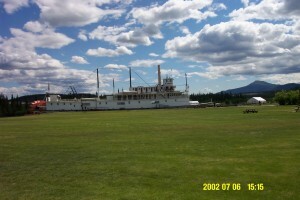 Click on the image to see the full sized image. I ran some final errands in preparation for departure and finalized most of the packing for the trip. 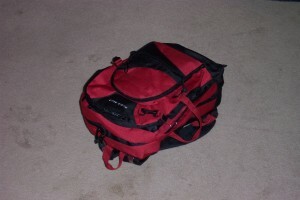 I only took a small pack with me which contained some clothes and a few other necessities. I also did some tidying up around my apartment just so I didn’t come back to a big mess (and, truthfully, so I didn’t get evicted for improper housekeeping). I also packed my camera complete with sufficient memory cards for about 280 photographs. 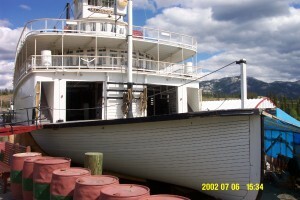 I made sure I had sufficient cash to cover most expenses and also took some American cash with me in case I crossed into Alaska. 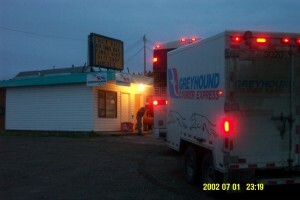 I left for the Greyhound terminal around noon. 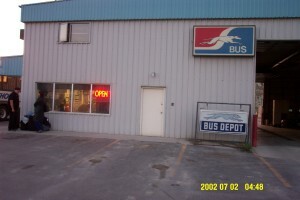 Once there, I settled on taking the 6:00PM semi-express bus to Edmonton. This left several hours to hang around in the bus depot. I ended up chatting with a couple of folks and playing a few games of Ms Pac Man. 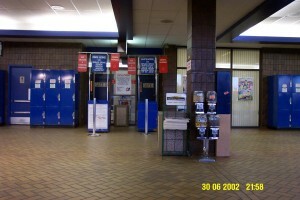 I also took a picture of the inside of the depot. 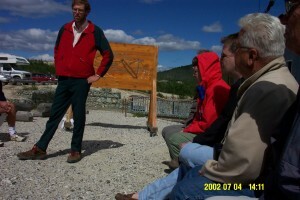 Along the way to Red Deer, I chatted with a fellow from Nelson. 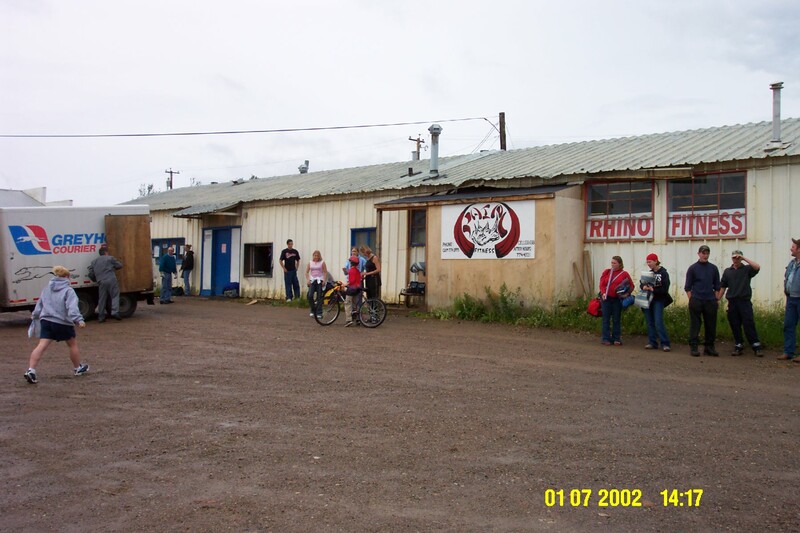 We stopped for about 15 minutes in Red Deer. 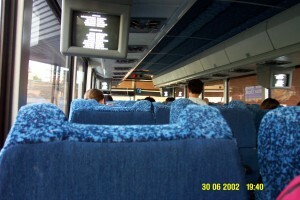 So I took a picture of the inside of the bus. The trip to on to Edmonton was occupied partially by watching the “in flight” movie “Road to El Dorado”. 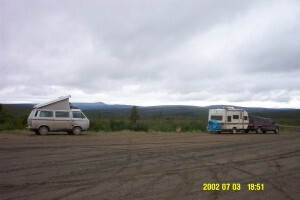 It turned out that a couple of others were making the trip to Whitehorse and they had started in Thunder Bay. I had thought 33 hours was bad. Wow. We arrived in Edmonton shortly before 10:00PM and had over two hours to kill. 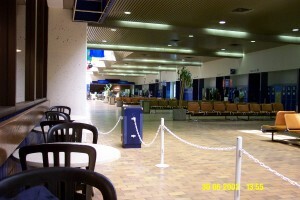 So I took a picture of the inside of the Edmonton Greyhound terminal. 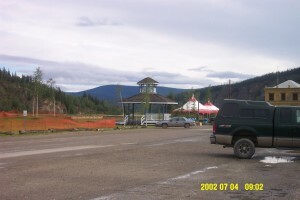 I also took a picture when we got to Dawson Creek. 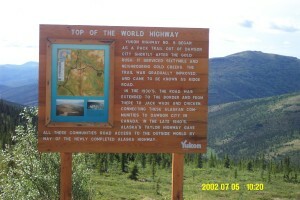 Note we crossed into the Pacific time zone at the Alberta-BC border. 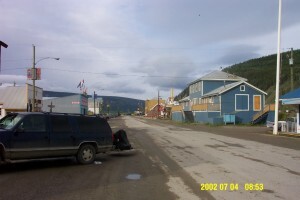 We arrived in Dawson Creek shortly after 7:00AM Pacific time. 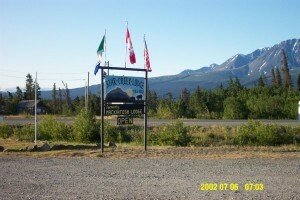 We left Dawson Creek at 8:00AM. 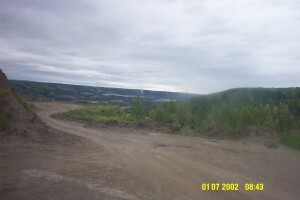 On the way to Fort St. John, I got a picture of the Peace River valley. 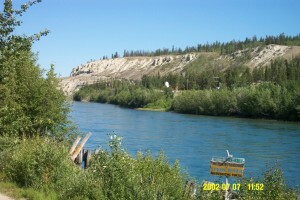 After passing through Fort St. John around 9:00AM (Pacific Time), we stopped for a rest and some food at Buckinghorse River around noon. 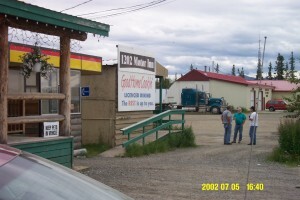 Then we arrived in Fort Nelson at 2:15PM (and left at about 3:00PM). At about 4:00PM, the bus driver stopped for a “smoke” and we got to take photos and generally take a break from riding the bus. 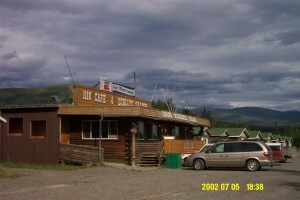 We stopped for supper at Toad River at about 6:00PM. 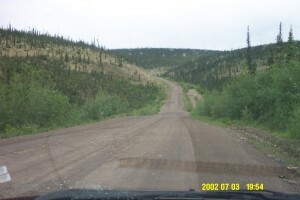 The driver informed us that there would be several stops between here and Watson Lake with photo ops. Also, the weather was starting to improve at this point. 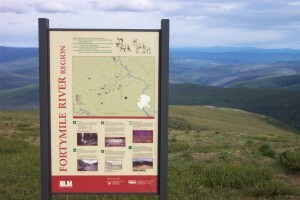 At about 7:20PM we stopped briefly at Muncho Lake and looked at the Terminal Ranges of the Rocky Mountains. 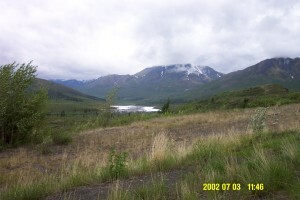 The top photo to the left is looking out over Muncho Lake and the bottom one looks up the road where you can see some clouds on the mountain in the background. 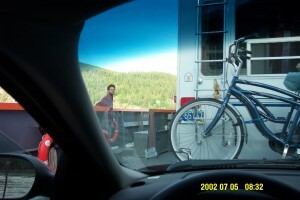 At about 8:15PM the driver asked how many tourists were aboard. 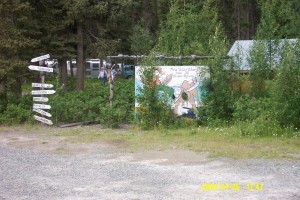 Everyone answered in the affirmative so we stopped at the Liard River Hot Springs. 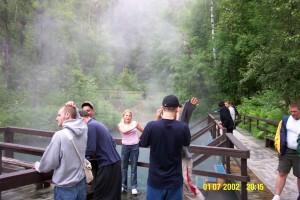 The first photo is of the pool at the spring itself. 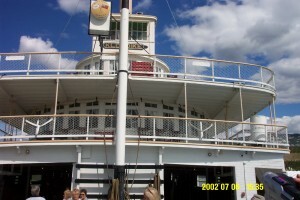 The next is a picture of the boardwalk on the way back to the parking lot. 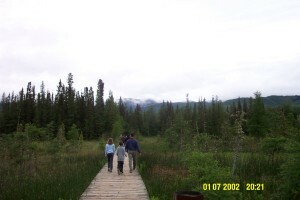 The last is a photo over the warm water (tropical) “lake” over which the boardwalk passes. The humidity made things a bit uncomfortable as did the legions of mosquitoes. 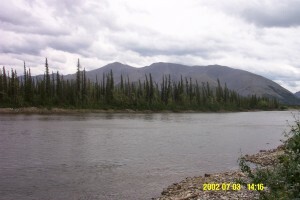 Along the Liard river about an hour after stopping at the hot springs. 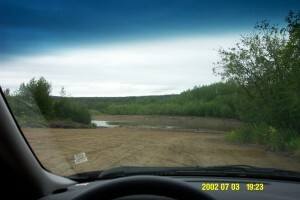 We arrived at Contact Creek about 10:10PM as we made our way into the Yukon for a brief visit. 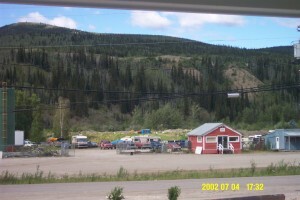 At about 11:15PM we arrived in Watson Lake. The sun had set by this time although the sky was not particularly dark. 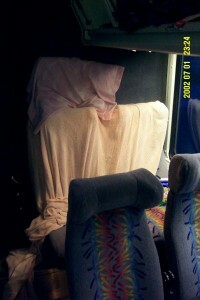 A nest that a couple of fellow travellers had created at the back of the bus. These folks had been on the bus since Thunder Bay. 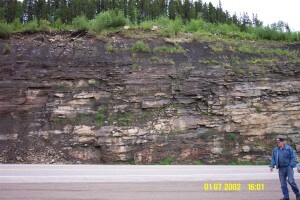 I caught some sleep on the way from Watson Lake onward. 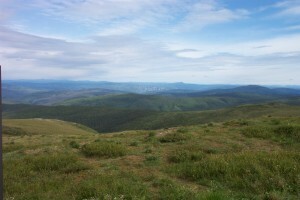 However, as the sun started to rise behind the hills, my attention was grabbed. 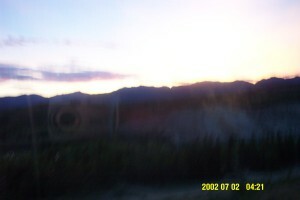 To the right is a photo (taken from a moving bus) of the sun rising behind the hill. 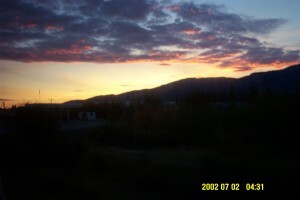 This one was taken about 4:20AM and at this point the sun had been rising behind the hills for some time. 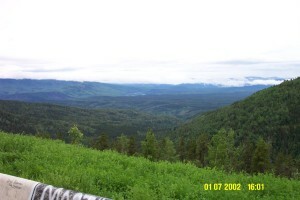 In fact, it has been noticeable since Teslin at about 2:55AM. Another picture of sunrise, about ten minutes later. 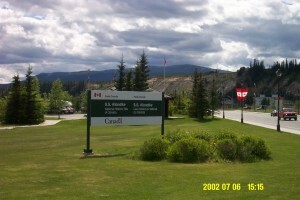 Not long before arriving in Whitehorse. Again taken from a moving bus. Note the reflection off the clouds. 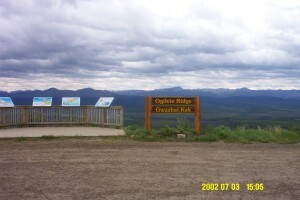 I spent the next hour and a half or so touring around Whitehorse killing time until my car rental reservation at 10:00AM. 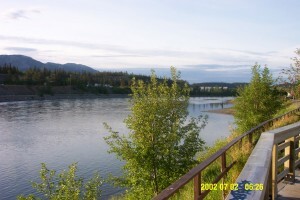 This photo is looking across the Yukon River from Jubilee Park. 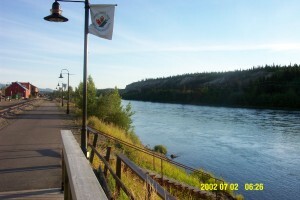 This is after I stopped for coffee at Tim Hortons and walked around downtown Whitehorse for some time. 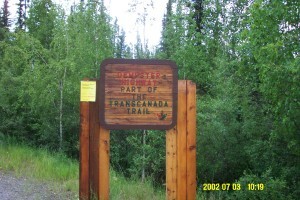 And the Trans Canada Trail marker (near the same location as the previous picture). 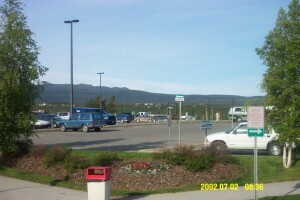 I finished strolling around Whitehorse and caught a cab to the airport to wait around for my car rental around 8:00AM. 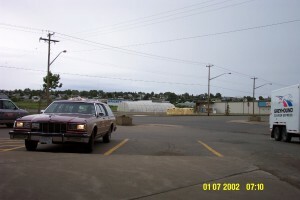 While killing time, I took a picture of the parking lot. Go figure. 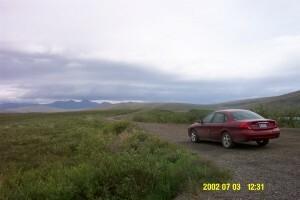 I later had breakfast at the restaurant in the airport then picked up my rental car. I took this one around Noon, part way up the Klondike highway. I took this one at about 1:15PM. It looks like it might be the “fingers”. It looks nice anyway. 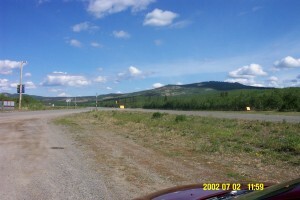 After I took this, I stopped for ice cream and gas at Pelly Crossing where I met a couple that was motorcycling from Colorado and then motored on into Dawson City. 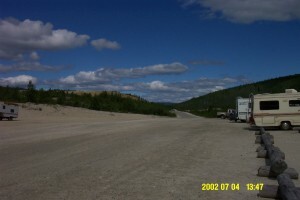 It was quite hot along the Klondike highway. 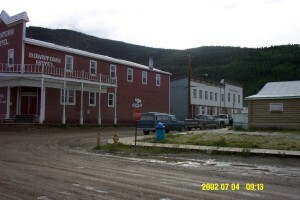 I arrived at Dawson City at about 6:40PM and drove around for a bit, scouting for a hotel or something of that sort. 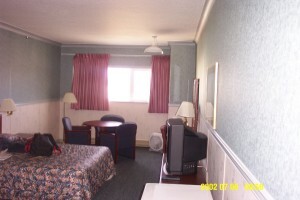 Then I checked in a motel some distance out from the main city (on the other side of a mountain) called the Bonanza Gold. 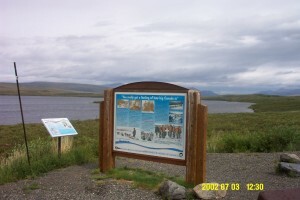 This picture shows the sign for it from the parking lot. 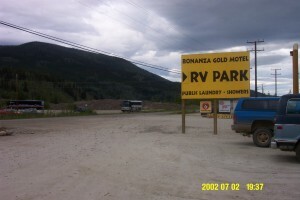 A photo of the Bonanza Gold itself with my rental car in the foreground. 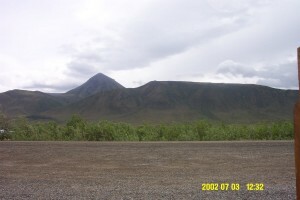 After collecting some various bits together, checking out of the motel and purchasing a spare tire (without a rim), I set off on the Demptster. 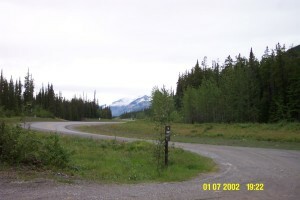 To the right are two photos from the rest stop at the turnoff from the Klondike highway onto the Demptser. I took these at about 10:20AM. 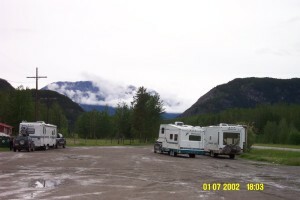 This one was taken at a turnout at Tombstone mountain. Taken around 11:45AM. I’m not sure where these three were taken but it was at about 12:30PM. I’m not certain about these two either except that they were taken at about 2:15PM. 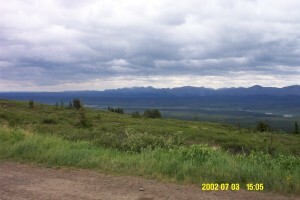 Notice the overcast weather. It’s been drizzling on and off up to this point. 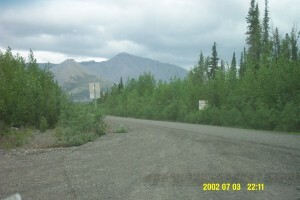 Ogilvie Ridge at about 3:00PM. 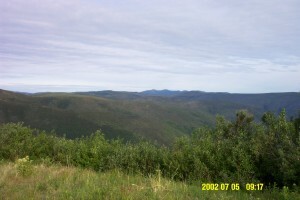 The landscape from Ogilvie Ridge. 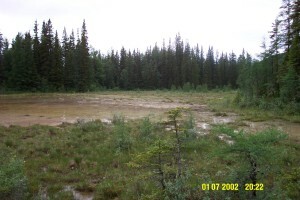 You can see the Ogilvie river in the distance. Note how heave the overcast is. It is actually drizzling at this point although you cannot see it in the photos. 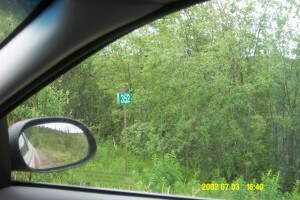 A kilometer marker (km352) along the highway. Taken at 4:40PM. Note that it has taken 6 hours and 20 minutes to travel 350 kilometers at an amazing 55km/h average. 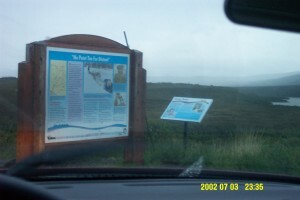 I arrived at the Arctic Circle ahead of the rain (or between it by the look of the ground) at about 6:45PM. 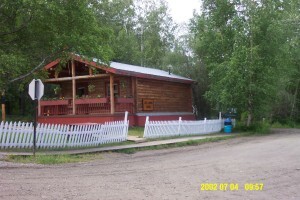 I stopped for about an hour at Eagle Plains to have a wonderful Turkey dinner and buy gas. It was starting to rain there when I left. 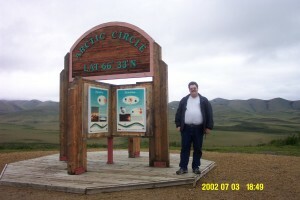 Some nice tourists who were also stopped took this photo of me beside the sign at the Arctic Circle. I even found the strength to take a photo looking North amidst the super-sized swarming mosquitoes. 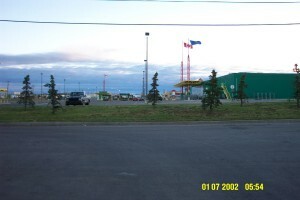 And another looking approximately southward through the parking lot. 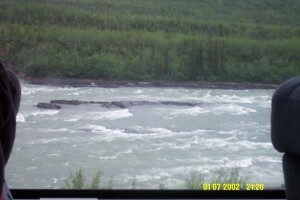 The Eagle River on the way back at about 7:25PM. 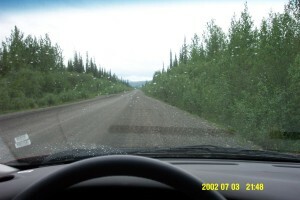 I’m avoiding mosquitoes by not getting out of the car. A picture of the road just south of Eagle Plains at about 7:55PM. 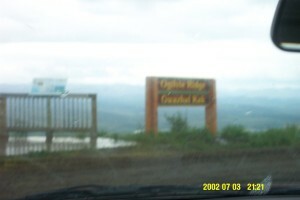 At Ogilvie Ridge in heavy rain mixed with snow at 9:20PM. I was having trouble holding the camera steady; it was barely above freezing and I didn’t have the heater on except enough to keep the windows clear. Another photo of the wet road. 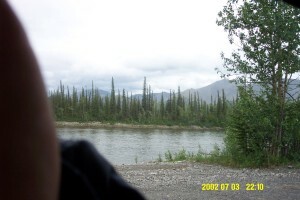 I’m not sure where this was taken but it looks like it is just coming out of the Ogilvie mountains judging by the time stamp. And back here again. Still not sure where it is. Taken about 11:35PM. The road again. This time see the weather ahead? 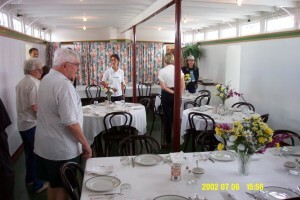 The camera is relative steady in the photo. 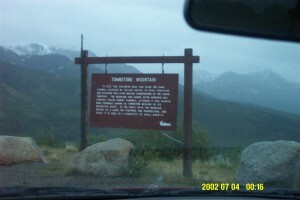 Tombstone Mountain at 12:15AM. 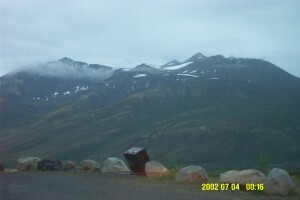 Notice the top of the mountain shrouded in clouds. Notice too that it is still light enough to get a clear photo. Still at Tombstone but looking a different direction. 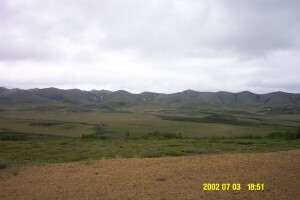 This is the last photo taken along the Dempster. 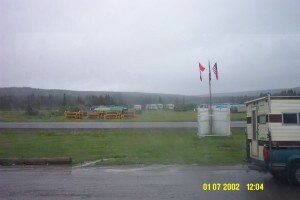 It was raining fairly hard all the way from here to Dawson where I arrived at about 1:45AM. 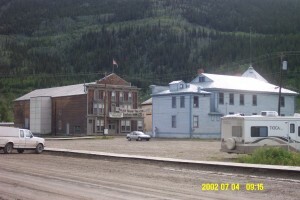 The rest of the photos from July 4 were taken in Dawson City. 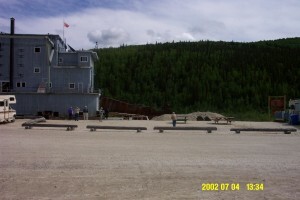 This one is of the Dawson City visitor’s center. 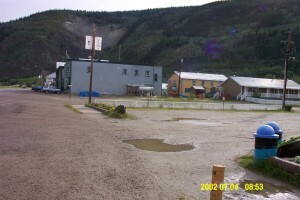 One of a series of photos of the Dawson streets. 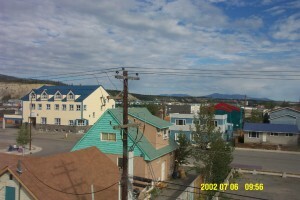 Another of a series of photos of Dawson streets. You guessed it. Even more. 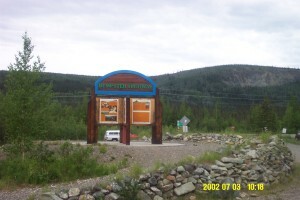 The Northwest Territories Visitor center. 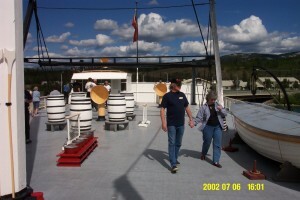 These two are of the Jack London Centre, still on the streets of Dawson. 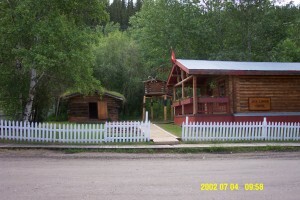 These two are of Robert Service’s cabin, again on the streets of Dawson. 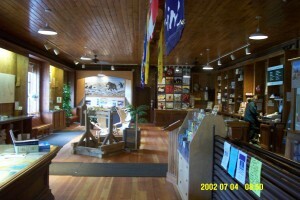 There was a presentation getting underway here which I took in, followed by a presentation at the Jack London Centre. 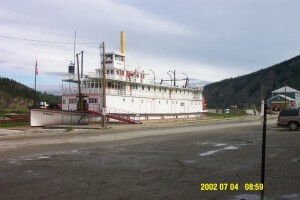 The following photos are of Dredge No 4 and were taken in the afternoon. It was quite warm and the sun was rather bright. 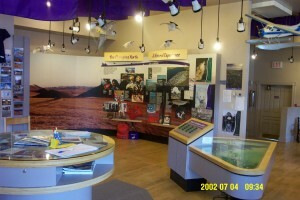 Below and right is a display inside the interpretive centre. 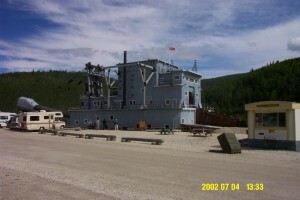 Another photo outside the dredge. I was bored while waiting for the tour to start. 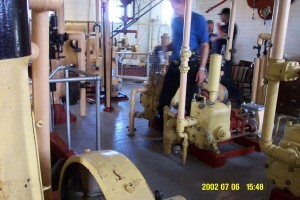 More stuff at the dredge. 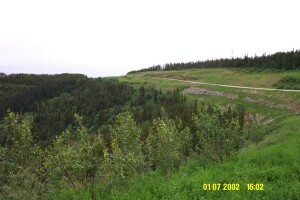 Right and below left are landscapes around the dredge. 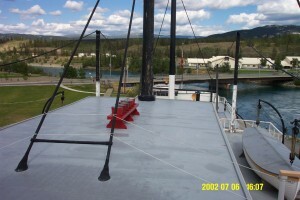 The third is a description of the how a dredge operates. The tour is getting underway. No more photos of the dredge on this trip; the batteries in my camera finally gave out here and I didn’t have time to change them. Looking across the highway from the Bonanza Gold motel. 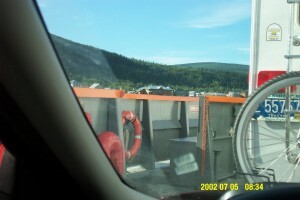 These two photos were taken from the ferry during the crossing of the Yukon river to get to the Top of the World highway. I started this leg of my trip well rested. 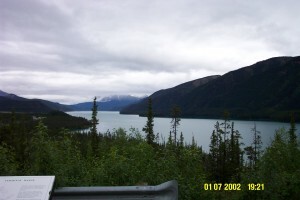 Some scenery at the rest stop just into Alaska. 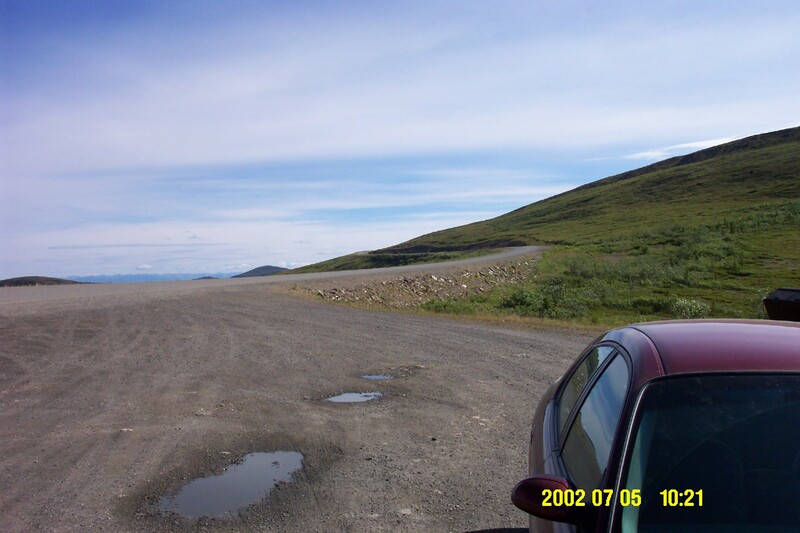 The road surface improved significantly even though it changed to gravel not far down the road from here. 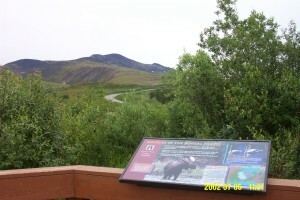 A rest stop along the highway in Alaska describing the Fortymile River area and a view of the landscape. I’m not sure exactly when these were taken. 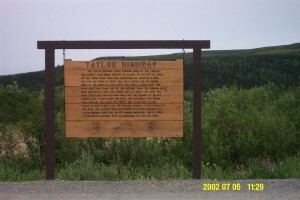 This is the sign describing the Taylor highway in Alaska. 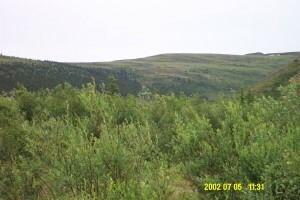 Below are two shots of the landscape in the area. I was starting to come down with a cold or something at this point so photographs become sparser as I wasn’t feeling as adventurous. 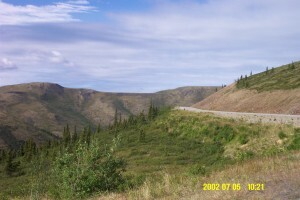 Back in the Yukon at Mile 1202 of the Alaska highway. I stopped for food here. 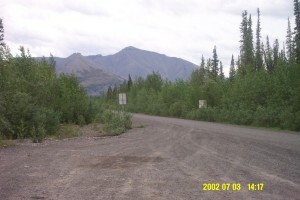 I filled up with gas in Tok, Alaska after I got off the Taylor highway. 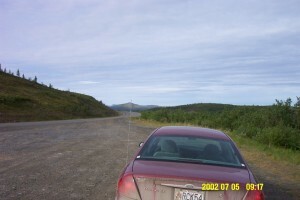 There was a rather long stretch of road between the US customs and Canadian customs along the road. 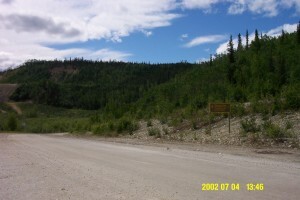 A photo from Pine Valley, Mile 1147 on the Alaska highway. 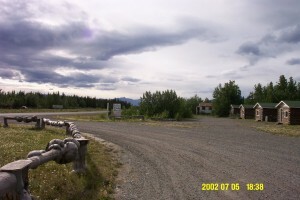 Kluane Wilderness village, Mile 1118. 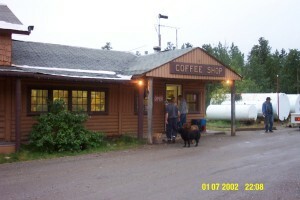 I stopped for about 8 hours of sleep here and to tank up on fluids as I hadn’t been drinking enough during the driving. 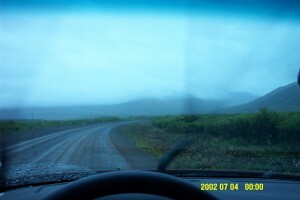 I got back on the road around 3:00AM after about 7 hours of sleep. 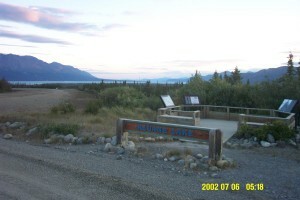 I stopped for a rest at the Kluane Lake rest stop after driving through very poorly traffic controlled construction for what seemed like forever. 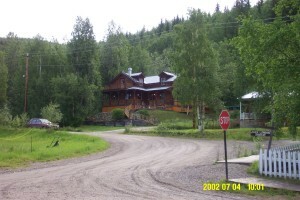 I stopped for breakfast at the Bear Creek lodge at Mile 1022. 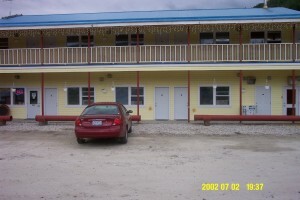 My room at the 202 Motor Inn in Whitehorse, where I stayed for a couple of days while I was there. The view out the window from the hotel room. 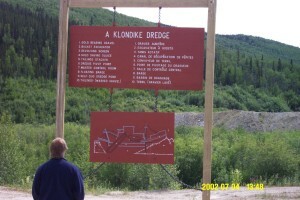 The Parks Canada sign at the SS Klondike. Why’d I take this one? Beats me. 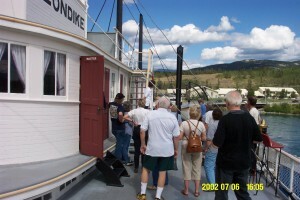 The following is a series of photos from the official tour of the SS Klondike. 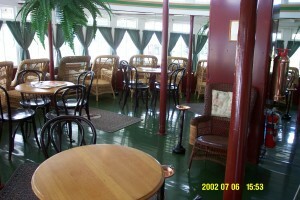 The first from before boarding. 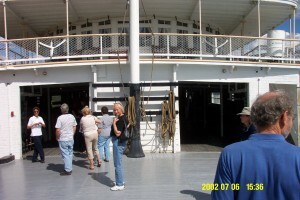 The tour is really getting underway as the tour guide gets us moving inside. 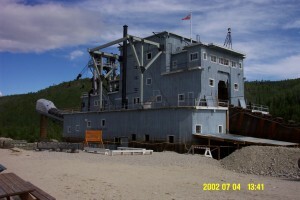 Some of the workings of the SS Klondike. 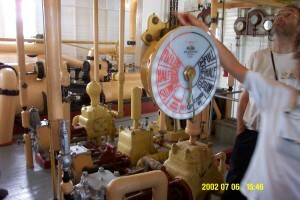 More of the fancy gizmos that made the boat tick. 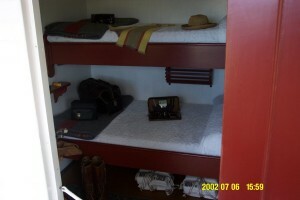 A picture from the passenger section. 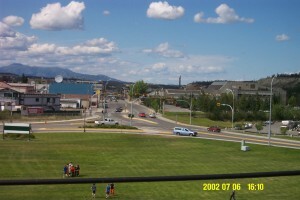 Looking out over downtown Whitehorse from atop the Klondike. 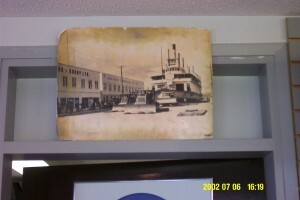 A photo of a photo of the Klondike being moved through downtown Whitehorse. 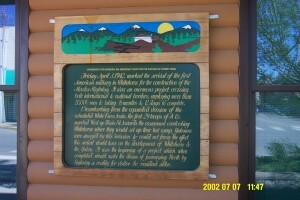 A plaque on the old train station. 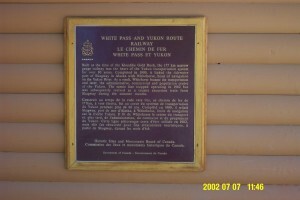 Another plaque on the old train station. 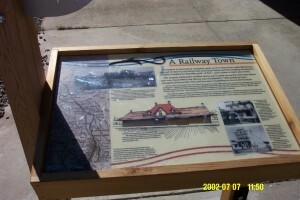 A historical plaque about the old railway. 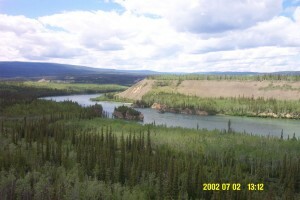 Some scenery along the Yukon river. Is that thing supposed to be a billboard? 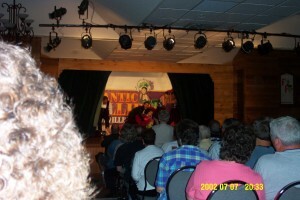 These are some of the photos I got at the Frantic Follies. 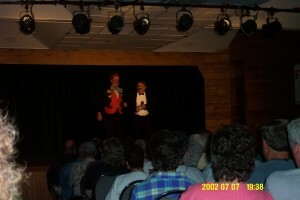 Oddly enough they allow flash photographs in their show. Most of them aren’t too spectacular as I was rather far back. 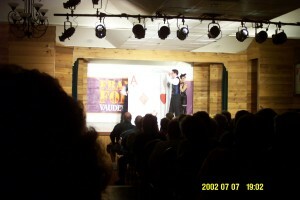 This one is a sort of card trick. You can’t see it easily in here (you should be able to with an image editor if you brighten it) but these guys are playing saws. 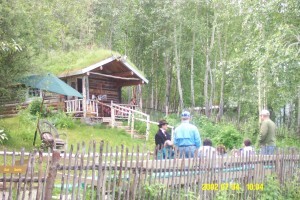 This guy is the “mayor” of whatever town a person sitting near the front is from. He “disrupts” the sales pitch of a less than honest salesman. 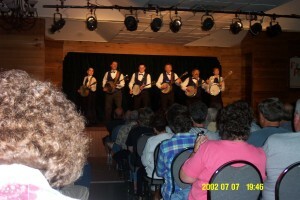 Yes, they are all playing banjos. Quite energetically, too. 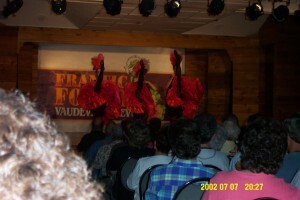 They even did the cancan. 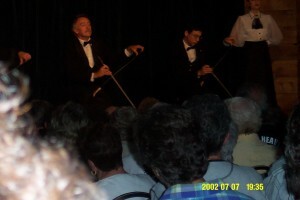 The “grand” finale. Of course, all of this is better in person.